The quality of an experience is so often predicated on ‘feel’. The first contact with your hotel can set the tone for the rest of your trip. If things don’t feel right, anxiety builds. 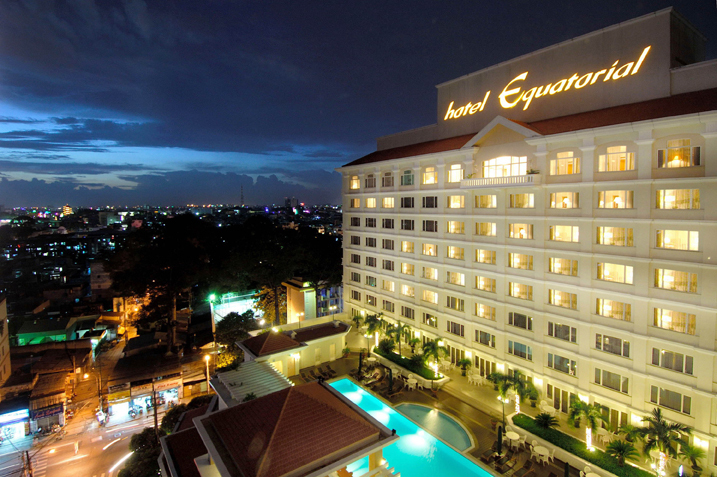 The Hotel Equatorial in Ho Chi Minh City, an international five-star hotel approximately 30 minutes from Tan Son Nhat International Airport, is a short taxi ride into the city’s major shopping and entertainment district. Perhaps it’s the building’s feng shui — Hotel Equatorial is located on the edge of the city’s District 5 and home to the world’s largest Chinatown, Cholon — but mostly, the feel good factor has little to do with the direction the property is facing. It’s the service, amenities and proximity to some of Vietnam’s most authentic experiences that does. The positive vibe at Hotel Equatorial starts with the porters. It’s rare to feel this well-looked after anywhere in this city. Over a set lunch that has been thoughtfully put together with travellers in mind — goi cuon (fresh spring rolls), sugar cane prawns, hoanh thanh (wonton) soup and an angel hair pasta, which is a delightful Asian take on what’s typically recognised as an Italian dish. “One of the things we feel that’s a highlight of our hotel is our staff. They are well trained, show attention to detail and love doing what they do, says Anna Fernandez, the director of sales and marketing the Hotel Equatorial. Indeed, the quality of food and service is on show, from the selection of dishes which offer an appropriate balance of flavours for travellers with palates wanting a subtle entrance into local Vietnamese cuisine, to the vigilant but not overbearing wait staff who keep lunch ticking over at a rate that feels, well, just about right. The guest rooms at Hotel Equatorial, of which there are 333 including suites, are what you’d expect from an international five-star hotel and all come with a standard array of features, including high-speed internet, satellite TV and mini-bar. The Deluxe rooms are 32sqm and come with a choice of king-size bed or two adjoining single beds. More discerning travellers can opt for an upgrade to the Executive Deluxe rooms which are 38sqm and spacious enough to fit up to two roll-away beds in addition to the king-size bed or two adjoining single beds. Aside from the extra space in the Executive Deluxe rooms, the clincher is the spacious balcony which affords guests with a bird’s eye view of the vibrant way of life in the streets and hems (alleys) of the surrounding neighbourhood below — something to which very few five-star hotels in Ho Chi Minh City can lay claim. As for amenities, Hotel Equatorial has one of the best hotel swimming pools in Ho Chi Minh City, and can again lay another claim to having one of the only swim up bars in the city. A necessity in a city where daytime temperatures rarely drop below 30 degrees Celsius. Inside by the lobby, Flo Lounge is one of the few remaining hotel bars in such a rapidly changing city that affords a glimpse back in time to what perhaps pre-1975 reunification might have felt like with its velour retro-style furniture in browns and oranges, mood lighting and plush carpeted floor. It’s the perfect place for a happy hour drink or two before hitting the streets in the cool of the evening to explore the district by night. Anybody thinking that Hotel Equatorial might be in a dull location a little too far away from the buzz of District 1, needs to think again. It’s good news for travellers with a short stay in Ho Chi Minh City, because District 5 offers some of the most authentic experiences in the city — perhaps in all of Vietnam. District 5 has remained largely untouched by the wrecking ball that has taken to the inner business district of Ho Chi Minh City over the past decade. While much of the French colonial-era architecture has either been demolished or is earmarked for demolition downtown, many of the shophouses, streets and alleyways in District 5 retain the look, smell and feel of what the bustling Chinese merchant district was decades ago. No more than 200m from Hotel Equatorial is Ho Thi Ky Street, a narrow thoroughfare that links the major streets of Hung Vuong and Ly Thai To. Best explored on foot, branching off Ho Thi Ky Street are no less than a dozen small hems with more branching off them. It’s a fantastic insight into how many Vietnamese — including one of Vietnam’s largest Khmer communities who fled Pol Pot’s evil regime in the 1970s and 1980s — live their lives without feeling like you’re prying, and the perfect opportunity to spread your culinary wings and delve into some authentic local cuisine. This enclave is also famous for flowers with many of the alleys lined with some of the freshest flowers for sale in the city. The best thing about it, however, is that it’s not a tourist destination — many expats living in Ho Chi Minh City don’t know about it — so it offers a most authentic experience. For those more adventurous, highly recommended is a tour on the back of a motorbike into Cholon to get a more rustic feel for life in Vietnam’s biggest city. Once separate from ‘Saigon’, Cholon has been etched into eternal literary folklore thanks to the likes of Graham Greene (The Quiet American) and Marguerite Duras (The Lover). In fact, the Arc En Ciel Hotel mentioned in Greene’s book, and where he is alleged to have spent time socialising, still stands on the corner of Tan Da and Tran Hung Dao Streets. While The Lover was set almost 100 years ago, a tour through Cholon rewards the curious traveller with sights, sounds and smells unique to this part of Vietnam, some reminiscent of the novel. The feel is vastly different from any other part of the city. Vestiges of the old days still remain, conjuring up thoughts of what life must have been like in the colonies. The area is also dotted with numerous important temples, punctuated by a Catholic church or two nearby and markets, most notably Binh Tay Market, a must see if only to watch what goes on among the throng. Towards the end of Tran Hung Dao Street, it becomes awash with colour thanks to the fabric wholesalers that line the street and who supply Ho Chi Minh City’s myriad tailors. In this area visit Cha Tam Catholic Church where Ngo Dinh Diem, the first president of the Republic of Vietnam, fled to and was subsequently captured and overthrown from power. But at the end of the day, how you spend your stay at Hotel Equatorial is, as the locals say, up to you. Just see how you feel.